Brand new, brilliant uncirculated 2019 British Britannia 1 Ounce (Oz) gold bullion coins. 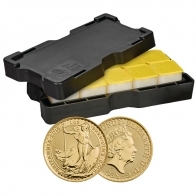 Britannia gold coins are the one of the preferred 1 Oz gold coins available, particularly among Europen investors. 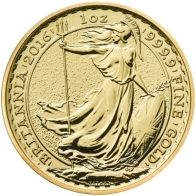 Unlike many gold coins, 1 ounce 2019 gold Britannias contain 999.9 pure gold. The coins are even more popular among UK investors because they are exempted from the Capital Gain Tax. The low premium gold coins were minted for the first time in 1987 and they had a face value of £100.00. The current version of the coin which has been available in the market since 2013 is made up of 24-carat fine gold. The coins features the fifth portrait of Queen Elizabeth II, which is considered the most recent, used for the first time in 2015. Jody Clark of the Royal Mint engraved the portrait, depicting the image of the Queen wearing a state diadem. The coins are packed in tubes. Each tube holds ten x 1 Oz fine gold coins. 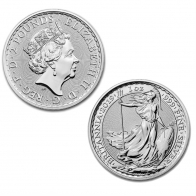 Britannia coins contain 24 carats of gold with a finer level of .9999. The coins are exempt from capital gains tax within the United Kingdom. The coins attract low premiums on higher quantity purchases. The front side of the coins features an image of Queen Elizabeth II as portrayed by Jody Clark. The back side features the classic Britannia design as portrayed by Philip Nathan. The history of the Britannia gold coins series can be traced to the expansion of the Roman Empire. During the expansion, conquered provinces were symbolically represented by female figures as a way of restoring peace and order and instilling a sense of unity. As a result of the conquests, the Roman Empire extended northwards, and the Roman army crossed over to reach British shores. The Britannia design made a pioneering appearance on Emperor Hadrian coins minted over 2,000 years ago. The Britannia design started appearing on coins again in 1672 during the reign of Charles II, and has done so with all the subsequent monarchs. Lady Britannia is considered a symbol of Britain’s national pride. 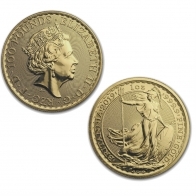 The Britannia design is recognizable throughout the world and the gold coins are the most preferred around the world. Gold coins historically do not lose value as a result of inflation. For example, gold sovereigns purchased 100 years ago still have roughly the same purchasing power. A savings account with the cash value of a sovereign in it from 100 years ago would essentially be worthless today. The stock market is characterized by volatility and it is important for investors to build a diversified portfolio. This protects against negative market movements. Gold coins traditionally are one of the best diversified assets that an investor can buy, as the gold price traditionally increases when the stock market loses value. Clients of SwissBullion.ch may select to purchase their gold coins for VAT-exempt storage in Switzerland or for delivery. VAT-exempt Swiss storage is free of charge for the first year, and clients selecting vault storage also benefit from favourable resell rates should they with to sell their holdings at a later date. Clients may select at any time to sell their holdings or have them delivered from vault storage.